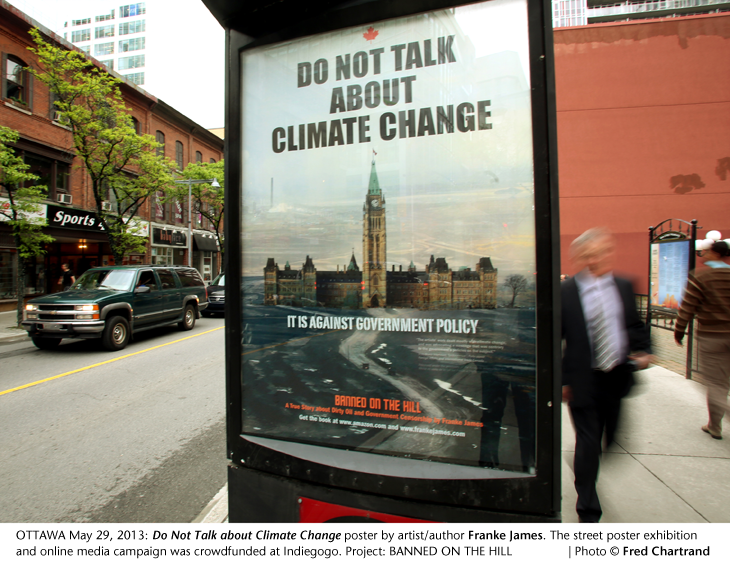 The street posters are just part of the campaign to get Ottawa talking about climate change. A topic they really do not want people to talk about. They are so busy selling tarsands oil and silencing anyone who mentions the fact that bitumen is highly polluting and contributing to climate change, that it’s a challenge, a big one. On May 20th, thanks to Indiegogo supporters, we succeeded in putting climate change at the top of a site that every Ottawa-insider knows and reads. The Hill Times is “Canada’s politics and government newsweekly” and their readers include “influential players in Parliament, Cabinet, the Prime Minister’s Office, the Privy Council,” and more. Sorry, either Adobe flash is not installed or you do not have it enabledThe “Do Not Talk” ad bumped off this pipeline ad which was running the previous week. The ad also debuted on the front page of Rabble, the voice of progressive journalists, writers, artists and activists across Canada. 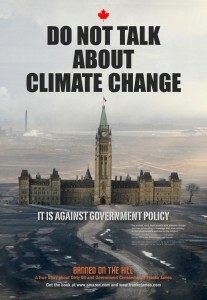 “Canada, under the government of Stephen Harper, has exhibited little patience for dissent. The government has muzzled government scientists, insulted Nasa climate experts, and dismissed environmental protesters as dangerous radicals. “Franke James, the artist in question, first got mad — now she is getting even. James, a Toronto-based activist with no shortage of gumption and political acumen, has turned the federal government’s efforts to silence her into a new book. RED EYE RADIO: Artist Franke James on how her work came to clash with the Harper government’s message of Tar Sands development. “More than two dozen senior officials and diplomats in Prime Minister Stephen Harper’s Conservative government monitored information about a Toronto artist over her criticism of the oil and gas industry’s environmental performance. 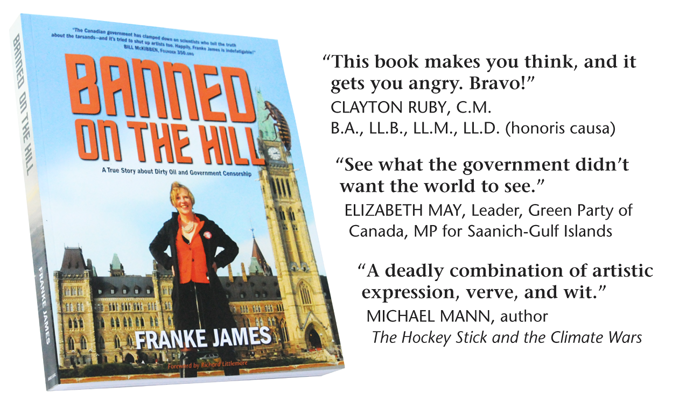 This behind the scenes reaction was described in passages from more than 2,000 internal federal emails and other records, featured in a new book – Banned on the Hill – released this month by the artist and environmental activist, Franke James. Then please join my campaign! For the price of an ebook or a small perk you can be part of my activist campaign and help make a difference. 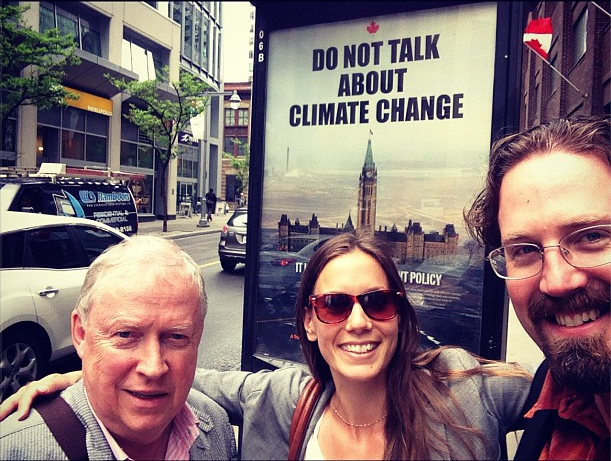 Visit Indiegogo and support Banned on the Hill so we can get the climate change message out in creative and fun ways across Canada — and around the world. These banner ads are just a taste of what’s in store!